When our good friends invited us to their wedding in Paros, we were convinced they said “Paris”. I mean, it made sense. She’s French, they’d met in Boston (where the civic ceremony was held), and he’s from a beautiful part of Romania called Timisoara (I love you Romania, but Paris… is Paris). So when talk started circulating of warm climates and beach vacations, we were a bit confused. It was only when we received the official invite that we realized they hadn’t been talking about Paris, at all. Paros: Greek Island. Not French Capital. Paros? The first thing we did was Google it. Long behold, nestled somewhere close to Naxos, floating in the middle of the Aegean Sea, was Paros. After 2 wonderful days spent lounging in Santorini, we took a 3 hour(ish) ferry ride to Paros. The ferry, by the way, operated by Blue Star Ferries, was BY FAR, the best ferry ride I have ever, ever taken. First of all, it was enormous. There was no cramming in between fellow passengers, running to get the first seat, or panic that you might be left standing for hours on end. Second of all, it was luxurious! Of course, this is coming from the backpacker who camped on the floor under a table on the ferry from Helsinki to Stockholm – so maybe take my opinion with a grain of (sea) salt. Tons of space for everyone to sit on couches, with tables on every level and a restaurant/cafe smack in the middle of things. Not to mention, the bathrooms which had walls facing out to sea and undoubtedly the best view on the boat. Apparently, unlike Prince Edward Island, the province, Prince Edward County, which is coincidentally, also an island, is in Ontario. Yup, pretty much in my backyard – and I had absolutely no idea. So how did I find out? With my husband out of town, I called up my girlfriend and together we agreed to meet smack in the middle of Ottawa and Toronto. Our fingers landed on Belleville and visions of kicking around a motel, ordering movies and sipping on boxed wine came rushing as we finalized our reservations. Not that it mattered. We have a certain reputation for making movie worthy memories whenever our paths cross, so I wasn’t too worried. Fortunately for us, Belleville is a mere 20 minutes from Prince Edward County so as we started to research “things to do” in the area, we were blasted with wineries from all sides. “Well, this just got interesting!” I thought. 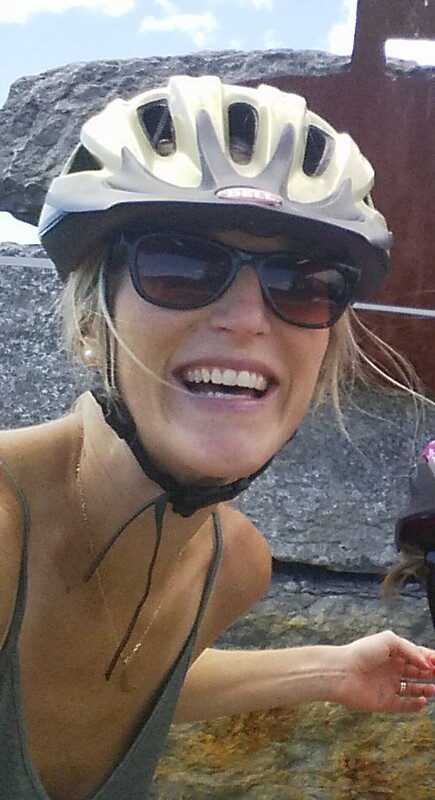 We hauled our bikes with us just for fun, figuring we’d park at our hotel in Belleville and then leisurely cycle our way from vineyard to vineyard. Once we actually arrived at the hotel, we realized that the first vineyard was a solid 20-30 min drive over a bridge and then south, way south. So, we piled both bikes into one car, and made our way to Hillier Creek Estates and Winery, where we tasted our first wine and the adventure began. 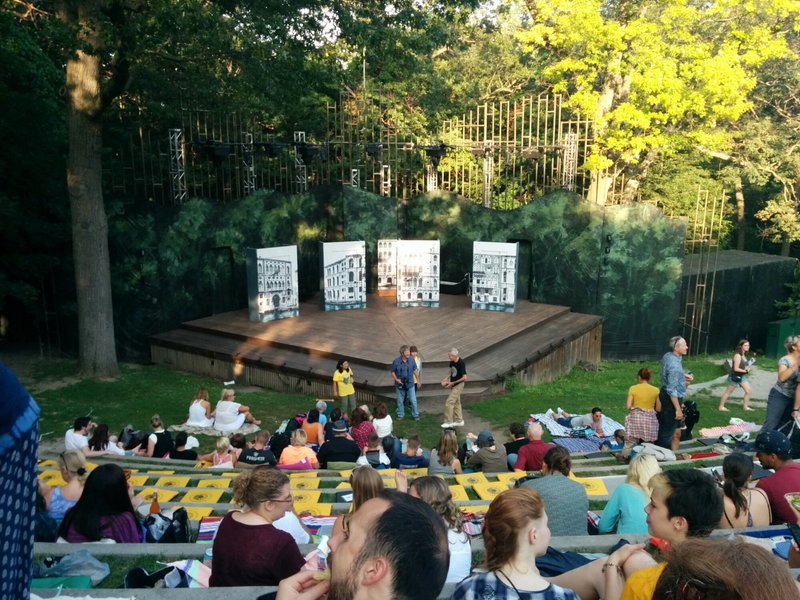 “Shakespeare in the Park” has long been on my hit-list of summer events to attend in Toronto, but somehow, until this year, it never quite made the cut. When my husband left a week before me with our toddler on a plane to Europe, and I was left with an open calendar, a night off and a burning desire to get the hell of the house, I finally bought a ticket. Or would have, if it wasn’t pay by donation, which it is. Partial to Othello, with a soft spot for Macbeth and a love for Romeo and Juliet that is so cliche, it’s a little embarrassing, I was delighted when I found out that during this year’s run of Shakespeare in High Park, Canadian Stage would be performing A Comedy of Errors, one of the plays that didn’t make it onto the high school curriculum, or university reading list, or sadly my bookshelf thereafter (for which there is really no excuse). The show started at 8 o’clock and I was warned to arrive early in order to ensure good seats (or any seats at all). Pulling in around 6:30pm, my girlfriend and I snagged the last two seats in the outdoor amphitheater where the production was to take place. Once we were seated, we realized that we had completely underestimated our entourage. Our stomachs rumbled as we saw veterans of the soiree pull out picnic baskets filled with sushi and wine, staring down at our roasted chickpeas and cheddar popcorn in disappointment (amateur move #1) and we continually shifted cheek to cheek as our bums squeaked loudly against the plastic bag we’d made into a make-shift blanket (amateur move #2) longing for something soft to separate our skin from the ants crawling beneath us. Thankfully as I was buying a couple bottled waters, I realized that you can also rent a blanket for the entirely of the show! Woo hoo! One problem solved. Our derrieres slowly regained circulation and our body temperatures started to rise. Let it be known that the show catering company whose name escapes me offered a lovely array of snacks for a very reasonable price! The blanket cost about $4 or so for the whole night and let me tell you, it was SO worth it. As the clocked ticked its way closer to 8pm, two more girlfriends joined us with some candy and chocolate mix that upped our food game a few notches. Unlike us, these two brought their own blanket and we started feeling much more event appropriate. Then, all of a sudden it started. The actors took their places and the play began. The quality of the actors was absolutely unparalleled, and the script hilarious! Well done William, well done. The irony that ensued was unmistakable. Nearly five minutes into the play, I reached over to offer one of my girlfriends a handful of candy, and inadvertently knocked over a can of cider. Five minutes later, one of my girlfriends opened a bottle of water that was a little too bubbly and promptly moistened our surrounding audience. A comedy of errors? We were it. The play lasted about 2 hours and was the absolute perfect way to spend a summer night in the city! Looking for something different to do, in support of a great organization? Look no further. Shakespeare in the park! Get thee there, and have some fun.